Drone Ban: Do Not Take Your Drone to These Countries! Drone sales for drones under $500 have risen 134% in the last year. Despite drone prices growing steadily more affordable, though, they still cost a pretty penny. It’s not always easy to find great deals on drones, either. If you’re headed abroad for a vacation, there’s no doubt you’ll want to bring your drone along. You want to catch those retro cars in Cuba from above. You want to catch the place where the sea meets the land in Tangier. Some countries, Cuba and Morocco included, have drone bans in place. And there’s nothing worse than lugging your expensive gear on vacation when you can’t even use it, right? Before you go, make sure to read up on drone laws by country so you know whether or not you can bring your favorite toy along. If there’s a drone ban where you’re going, you might even want to rethink your trip so you can get footage of your time abroad! Read on for everything you need to know! Why Do Drone Bans Exist? It was Nikola Tesla who first patented drone technology on a radio-controlled boat in 1898. Since then, it’s now used by consumers and militaries alike. It’s used to capture video footage, for surveillance and airstrikes. Although the technology isn’t new, legislation regarding drones is still in the works. Many countries are still unsure of the legal implications of consumer drone use, so they choose to ban them outright until they can work out the kinks. Yet other countries don’t have all-out bans in place, but their laws make consumer drone use very difficult. Some require permits, and some even require you to have each individual flight approved before flying. Many countries which ban drones have authoritarian governments. Some don’t even have access to public internet, and the government wants to control their access to data. To find out which reason applies to your country of choice, read up on the country’s government and history a little. You’ll likely come to all the conclusions you need to figure out the root of the drones ban there. Here’s the thing about drone bans. Some countries ban them outright. Others have such strict rules and regulations that it may as well be a ban. Make sure to consult the country you plan to visit’s drone laws before traveling, even if it’s not on this list. They may have rules which you’ll need to heed, even if drones aren’t banned there! Is your next vacation on the list? If so, better leave the drone at home! 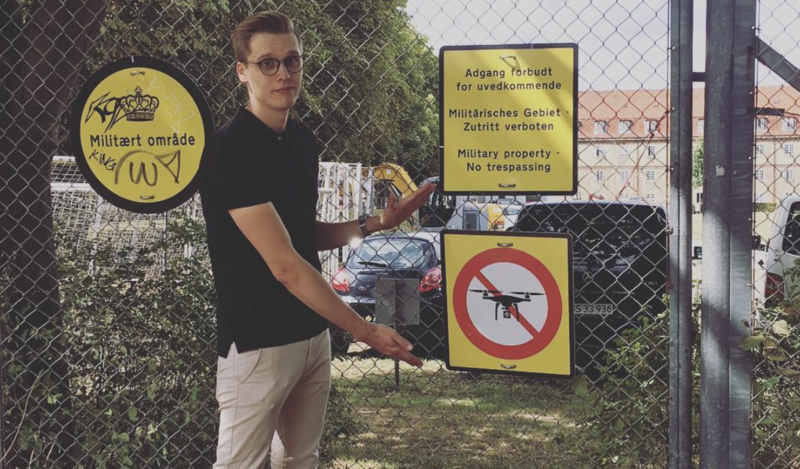 Two countries worth being mentioned are France and Austria – both have incredibly restrictive rules for flying drones. Be careful to fly your drone when you head to these (usually democratic and free) countries – when it comes to flying drones they’re not as liberal as they sound. Drones are super fun to bring on vacation. After all, nothing captures a gorgeous new country better than a bird’s eye view. Don’t get caught flying your drone in a country with drone bans, though. You could have your drone taken away with no reimbursement, you might get fined or even arrested. What other drone-related things do you need help with? Regardless of what it is, we’ve got you covered! Check out our drone guides for expert help on all things aerial and don’t forget to subscribe to our YouTube channel. The post Amazon Patent to have drones drop packages from as high as 25 feet appeared first on Dronethusiast. The post Artist Uses Drones to Light Up the Sky with Giant Shapes appeared first on Dronethusiast. The post Best Remote Control Boats For Kids | 2019 Reviews appeared first on Dronethusiast.